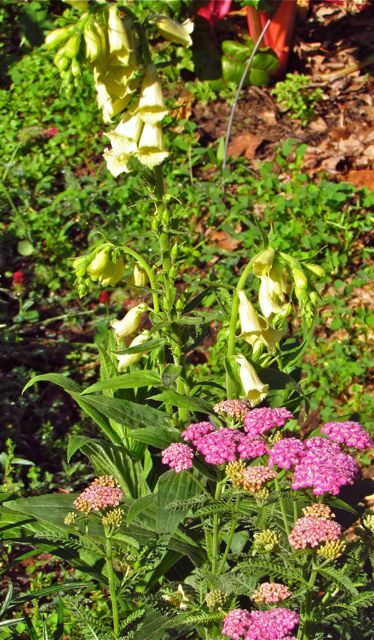 Foxgloves and yarrows invite pollinators to visit. 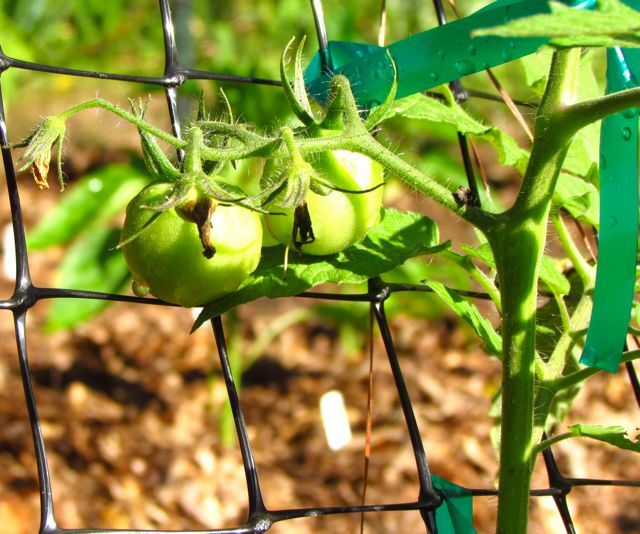 Last week, my garden sweltered beneath high temperatures in the nineties. This week, the temperatures plunged 25 degrees. This morning, our hill thermometer registered a low of 41 degrees Fahrenheit. In other words, it’s a typical late spring in the Piedmont of North Carolina. 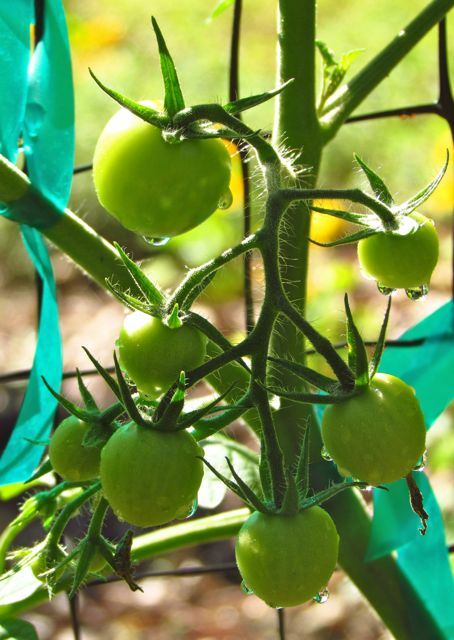 Experience has taught me that the trick to helping veggies survive spring’s wild weather swings is to plant vigorous plants during a settled spell of weather, mulch them heavily immediately, and water as often as necessary to keep the soil evenly moist. This year, my timing seems to have been pretty good. 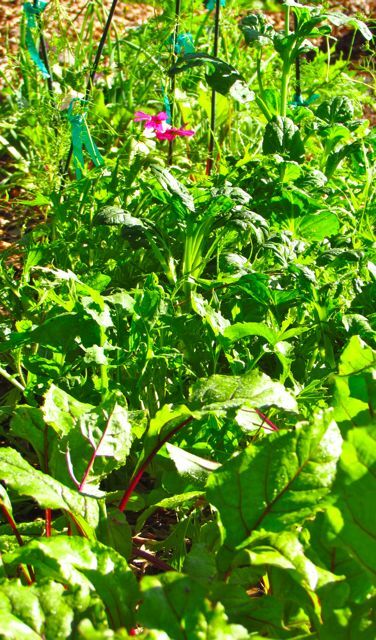 The spring veggies are still producing, although last week’s nineties caused some of the mesclun mix (Yankee greens, as I think of them) to bolt. Sugar Anns will replace these Sugar Sprints next year. As for that rain I mentioned, as usual, my little corner of the Piedmont is being overlooked. The city 30 miles to our east has had two major, multi-inch rain events in the last two weeks. Our two-week total isn’t even 1.5 inches. Of course, the folks in Raleigh also got hail, some flooding, and a few houses were set on fire by lightning. I’ll take gentle, light rain over dangerous storms every time, of course, but I get grumbly when I hear the TV weather folk talking about the “break in the drought.” Not at my house. The pink flower is a cosmos. 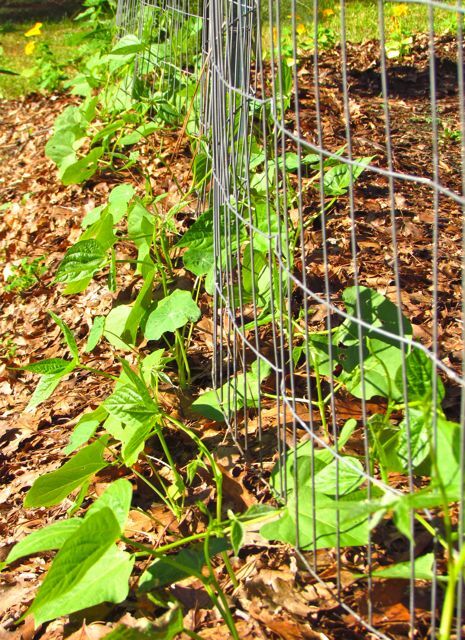 These Fortex pole beans seem even more vigorous than last year’s crop — yikes! 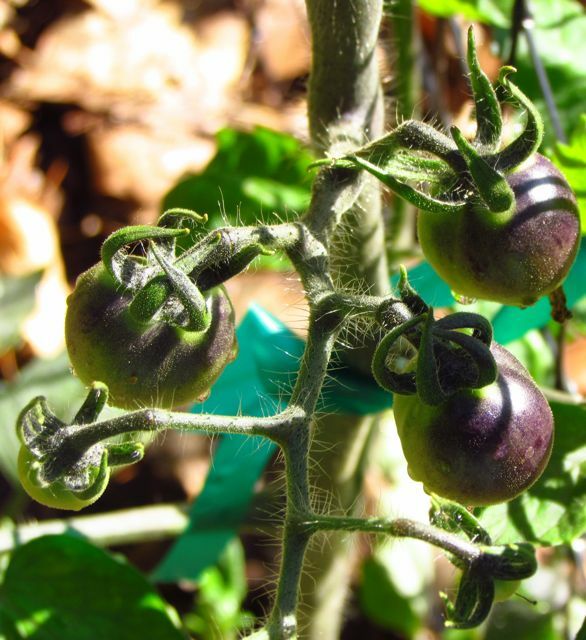 Check out the way the Indigo Rose tomatoes are already turning purple. I did a bit of research on these and learned that they only make anthocyanins (the purple-colored antioxidant) where the sun touches the skin, and the purple stays only in the top layers of the tomato. So this is one you’ll want to eat skin and all if you’re trying to take advantage of this nutrient. 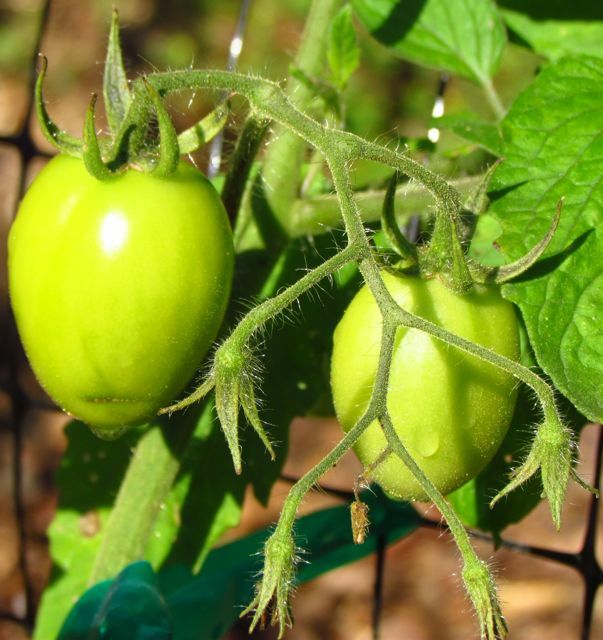 I also learned that the tomato is fully ripe when the bottom of the tomato is deep red. I’ll keep you apprised of their progress. Last but not least, two of my six squash plants had open flowers yesterday, so I was forced to remove their coverings so that pollinators could access the flowers. 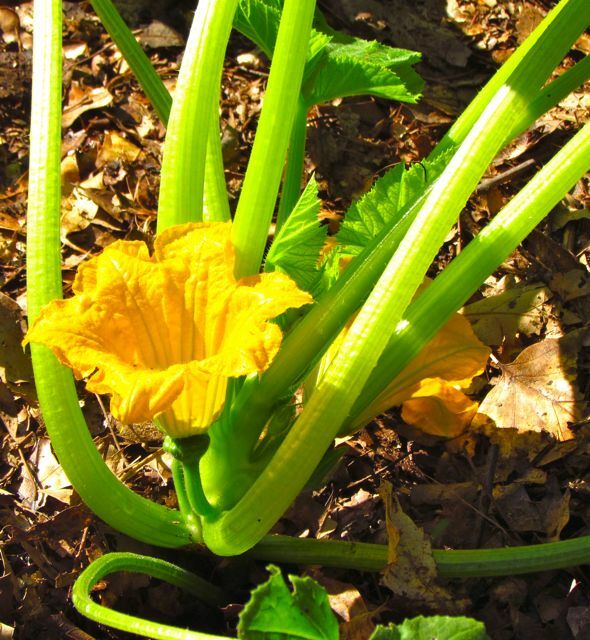 The plants look strong, and I’m hoping they’ll be able to resist the squash varmints long enough for us to grow weary of squash-filled dinners. As you might guess, our yard is still producing many blooming plants. I’ll show you some highlights soon, along with some wildlife updates. Now it’s time to pull more weeds, mulch, and continuously pray for gentle, abundant rain. 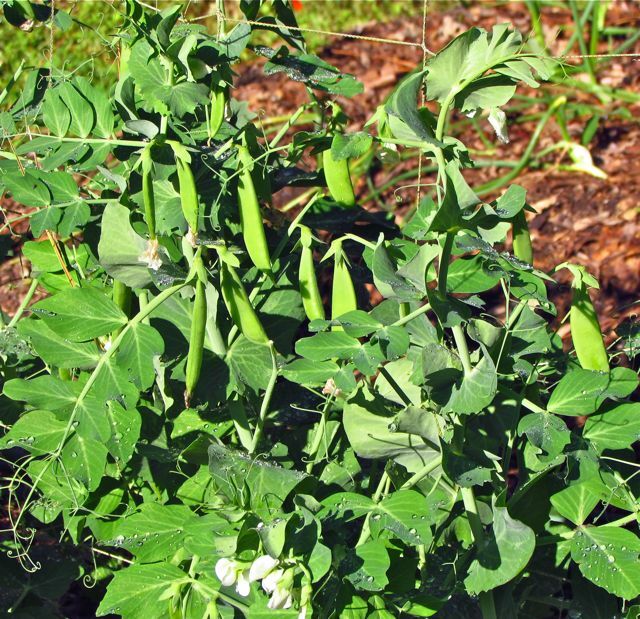 This entry was posted on May 11, 2012, 1:13 pm and is filed under Favorite Plants, piedmont gardening, Vegetable Gardening. You can follow any responses to this entry through RSS 2.0. You can skip to the end and leave a response. Pinging is currently not allowed. 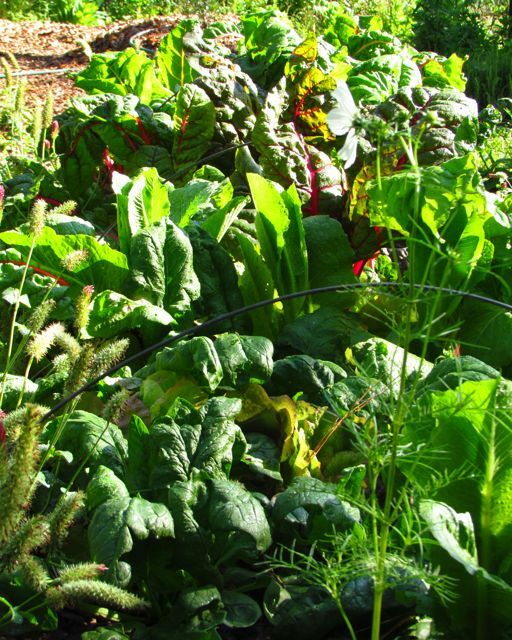 Great looking garden-I miss vegetable gardening in some ways. I know how much work it is too, but you can’t beat the flavor.